The Nazi salute, Hitler salute (German: Hitlergruß, lit. 'Hitler Greeting', IPA: [ˈhɪtlɐˌɡʁuːs], also German: deutscher Gruß, lit. 'German Greeting'), or Sieg Heil salute, is a gesture that was used as a greeting in Nazi Germany. The salute is performed by extending the right arm from the neck into the air with a straightened hand. Usually, the person offering the salute would say "Heil Hitler!" (Hail Hitler! ), "Heil, mein Führer!" (Hail, my leader! ), or "Sieg Heil!" (Hail victory!). It was adopted in the 1930s by the Nazi Party to signal obedience to the party's leader, Adolf Hitler, and to glorify the German nation (and later the German war effort). The salute was mandatory for civilians but mostly optional for military personnel, who retained the traditional military salute until the failed assassination attempt on Hitler on 20 July 1944. Use of this salute is illegal in modern Germany and Austria (Verbotsgesetz 1947), and is also considered a criminal offense in modern Poland, Slovakia, and Austria. In Canada, the Czech Republic, France, the Kingdom of the Netherlands, Sweden, Switzerland, and Russia, displaying the salute is not in itself a criminal offence, but constitutes illegal hate speech if used for propagating Nazi ideology. The salute was executed by extending the right arm to neck height and then straightening the hand so that it is parallel to the arm. Usually, an utterance of "Heil Hitler! ", or "Heil!" accompanied the gesture. If one saw an acquaintance at a distance, it was enough to simply raise the right hand. If one encountered a superior, one would also say "Heil Hitler". If physical disability prevented raising the right arm, it was acceptable to raise the left. The form "Heil, mein Führer!" was for direct address to Hitler. "Sieg Heil" was repeated as a chant on public occasions. Written communications would be concluded with either mit deutschem Gruß ("with German regards"), or with "Heil Hitler". In correspondence with high-ranking Nazi officials, letters were usually signed with "Heil Hitler". The salute gesture is widely believed to be based on an ancient Roman custom. However, no surviving Roman work of art depicts it, nor does any extant Roman text describe it. Jacques-Louis David's painting Oath of the Horatii (1784) may be the starting point for the gesture that became known as the Roman salute. The gesture and its identification with ancient Rome was advanced in other French neoclassic art. This was further elaborated upon in popular culture during the late 19th and early 20th centuries in plays and films that portrayed the salute as an ancient Roman custom. This included the silent film Cabiria (1914), whose screenplay was written by the Italian ultra-nationalist Gabriele d'Annunzio, arguably the forerunner of Benito Mussolini. In 1919, when he led the occupation of Fiume, d'Annunzio adopted the style of salute depicted in the film as a neo-Imperialist ritual; and it was quickly adopted by the Italian Fascist Party. 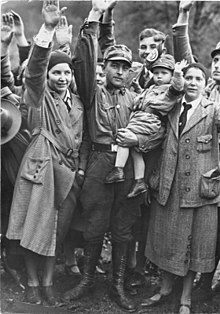 Some party members challenged the legitimacy of the so-called Roman salute, employed by Fascist Italy, as un-Germanic. In response, efforts were made to establish its pedigree by inventing a tradition after the fact. In June 1928, Rudolf Hess published an article titled "The Fascist Greeting", which claimed that the gesture was used in Germany as early as 1921, before the Nazis had heard about the Italian Fascists. He admits in the article: "The NSDAP's introduction of the raised-arm greeting approximately two years ago still gets some people's blood boiling. Its opponents suspect the greeting of being un-Germanic. They accuse it of merely aping the [Italian] Fascists", but goes on to ask, "and even if the decree from two years ago [Hess' order that all party members use it] is seen as an adaption of the Fascist gesture, is that really so terrible"? Ian Kershaw points out that Hess did not deny the likely influence from Fascist Italy, even if indeed the salute had been used sporadically in 1921 as Hess claimed. Ten- and eleven-year-old Berlin schoolchildren, 1934. The salute was a regular gesture in German schools. Under a decree issued by Reich Minister of the Interior Wilhelm Frick on 13 July 1933 (one day before the ban on all non-Nazi parties), all German public employees were required to use the salute. The decree also required the salute during the singing of the national anthem and the "Horst-Wessel-Lied". It stipulated that "anyone not wishing to come under suspicion of behaving in a consciously negative fashion will therefore render the Hitler Greeting". A rider to the decree, added two weeks later, stipulated that if physical disability prevented raising of the right arm, "then it is correct to carry out the Greeting with the left arm". On 27 September, prison inmates were forbidden to use the salute, as were Jews by 1937. By the end of 1934, special courts were established to punish those who refused to salute. Offenders, such as Protestant preacher Paul Schneider, faced the possibility of being sent to a concentration camp. Foreigners were not exempt from intimidation if they refused to salute. For example, the Portuguese Consul General was beaten by members of the Sturmabteilung for remaining seated in a car and not saluting a procession in Hamburg. Reactions to inappropriate use were not merely violent but sometimes bizarre. For example, a memo dated 23 July 1934 sent to local police stations stated: "There have been reports of traveling vaudeville performers training their monkeys to give the German Greeting. ... see to it that said animals are destroyed." The salute soon became part of everyday life. Postmen used the greeting when they knocked on people's doors to deliver packages or letters. Small metal signs that reminded people to use the Hitler salute were displayed in public squares and on telephone poles and street lights throughout Germany. Department store clerks greeted customers with "Heil Hitler, how may I help you?" Dinner guests brought glasses etched with the words "Heil Hitler" as house gifts. The salute was required of all persons passing the Feldherrnhalle in Munich, site of the climax of the 1923 Beer Hall Putsch, which the government had made into a shrine to the Nazi dead; so many pedestrians avoided this mandate by detouring through the small Viscardigasse behind that the passage acquired the nickname "Dodgers' Alley" (Drückebergergasse). 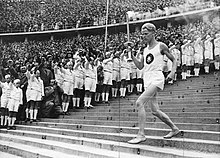 Fritz Schilgen carrying the Olympic torch at the Berlin Olympic Stadium. The public gave Nazi salute. 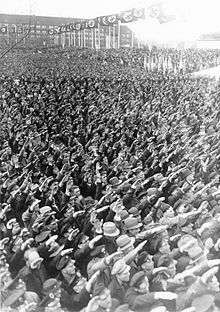 Jehovah's Witnesses came into conflict with the Nazi regime because they refused to salute Adolf Hitler with the traditional "Heil Hitler" salute, believing that it conflicted with their worship of God. Because refusing to salute Hitler was considered a crime, Jehovah's Witnesses were arrested, and their children attending school were expelled, detained and separated from their families. The Wehrmacht refused to adopt the Hitler salute officially and was able for a time to maintain its own customs. A compromise edict from the Reich Defense Ministry, issued on 19 September 1933, required the Hitler salute of soldiers and uniformed civil servants while singing the "Horst-Wessel-Lied" and national anthem, and in non-military encounters both within and outside the Wehrmacht (for example, when greeting members of the civilian government). At all other times they were permitted to use their traditional salutes. Use of the Hitler salute was also permitted when in uniform. However, it is of importance to note that according to (pre-Nazi) Reichswehr and Wehrmacht protocol, the traditional military salute was not permitted when the saluting soldier was not wearing a uniform headgear (helmet or cap). Because of this, all salutes performed bareheaded, even when in full uniform and on duty, made the Nazi salute de facto mandatory in most situations. Another example is a cartoon by New Zealand political cartoonist David Low, mocking the Night of the Long Knives. Run in the Evening Standard on 3 July 1934, it shows Hitler with a smoking gun grimacing at terrified SA men with their hands up. The caption reads: "They salute with both hands now". When Achille Starace proposed that Italians should write Evviva Il Duce in letters, Mussolini wrote an editorial in Il Popolo d'Italia mocking the idea. Today in Germany, Nazi salutes in written form, vocally, and even straight-extending the right arm as a saluting gesture (with or without the phrase), are illegal. It is a criminal offence punishable by up to three years of prison (Strafgesetzbuch section 86a). Usage for art, teaching and science is allowed unless "the existence of an insult results from the form of the utterance or the circumstances under which it occurred." Use of the salute has also been illegal in Austria since the end of World War II. Usage that is "ironic and clearly critical of the Hitler Greeting" is exempt, which has led to legal debates as to what constitutes ironic use. One case involved Prince Ernst August of Hanover who was brought to court after using the gesture as a commentary on the behavior of an unduly zealous airport baggage inspector. On 23 November 2007, the Amtsgericht Cottbus sentenced Horst Mahler to six months of imprisonment without parole for having, according to his own claims, ironically performed the Hitler salute when reporting to prison for a nine-month term a year earlier. The following month, a pensioner named Roland T was given a prison term of five months for, amongst other things, training his dog Adolf to raise his right paw in a Nazi salute every time the command "Heil Hitler!" was uttered. The Afrikaner Weerstandsbeweging, a South African neo-Nazi organization known for its militant advocacy of white separatism, has espoused brown uniforms as well as Nazi German-esque flags, insignia, and salutes at meetings and public rallies. Hundreds of supporters in 2010 delivered straight-arm salutes outside the funeral for AWB leader Eugène Terre'Blanche, who was murdered by two black farm workers over an alleged wage dispute. On 28 May 2012, BBC current affairs programme Panorama examined the issues of racism, antisemitism and football hooliganism, which it claimed were prevalent among Polish and Ukrainian football supporters. The programme, titled Euro 2012: Stadiums of Hate, included footage of Ukrainian supporters giving the Nazi salute and shouting "Sieg Heil". The two countries hosted the international football competition UEFA Euro 2012. On 18 July 2015, The Sun published an image of the British Royal Family from private film shot in 1933 or 1934, showing Princess Elizabeth (the future Queen, then a young girl) and the Queen Mother both performing a Nazi salute, accompanied by Edward VIII, taken from 17 seconds of home footage (also released by The Sun). The footage ignited controversy in the UK, and there have been questions as to whether the release of this footage was appropriate. Buckingham Palace described the release of this footage as "disappointing", and has considered pursuing legal action against The Sun, whereas Stig Abell (managing director of The Sun) said that the footage was "a matter of national historical significance to explore what was going on in the [1930s] ahead of the Second World War". American white supremacist Richard B. Spencer drew considerable media attention in the weeks following the 2016 U.S. presidential election, where, at a National Policy Institute conference, he quoted from Nazi propaganda and denounced Jews. In response to his cry "Hail Trump, hail our people, hail victory! ", a number of his supporters gave the Nazi salute and chanted in a similar fashion to the Sieg Heil chant. A junior prom photo of about 50 male students from the class of 2019 at Baraboo High School, most apparently giving a Sieg Heil Nazi salute, was shared on social media and quickly spread on Twitter on November 11, 2018. The photo attracted attention from the Auschwitz Memorial Twitter account, which issued a response, State Senator Jon Erpenbach, who represents Baraboo, and Wisconsin Governor-elect Tony Evers, who condemned the photo. As part of her response to the incident, Lori M. Mueller, Baraboo School District Administrator, said "The photo of students posted to #BarabooProud is not reflective of the educational values and beliefs of the School District of Baraboo. The District will pursue any and all available and appropriate actions, including legal, to address." The Baraboo Police Department said officers are assisting with the school district's investigation into the "controversial photo." CNN fired political commentator Jeffrey Lord on August 10, 2017 after he tweeted "Sieg Heil!" to Angelo Carusone, president of Media Matters for America, suggesting Carusone was a fascist. A similar gesture was used by the fictional Nazi-affiliated organization Hydra from Marvel Comics, with both arms outstretched, clenched fists and the phrase "Hail Hydra" uttered by members of the organization. ^ a b c d Kershaw, Ian (2001). The "Hitler Myth": Image and Reality in the Third Reich. Oxford University Press. p. 60. ISBN 978-0192802064. ^ Büchner, Alex (1991). German Infantry Handbook, 1939–1945: Organization, Uniforms, Weapons, Equipment, Operations. Schipper Publishing. ISBN 978-0-88740-284-5. ^ a b c d e Sehmer, Alexander (20 July 2015). "Countries where Nazi salute is illegal". The Times of India. Archived from the original on 23 July 2015. Retrieved 14 June 2018. ^ "Hajloval. Hrozí mu tři roky vězení". Deník (in Czech). Retrieved 19 October 2016. ^ a b O'Dea, Claire (21 May 2014). "Hitler salute ruled not always illegal". Swissinfo.ch. Retrieved 27 May 2014. ^ a b "Swiss court rules that Nazi salute may be 'personal statement', not racism". The Guardian. Geneva. Associated Press. 21 May 2014. Retrieved 27 May 2014. ^ a b c Grunberger, Richard (1995). The 12-year Reich: a social history of Nazi Germany, 1933–1945 (illustrated ed.). Da Capo Press. ISBN 9780306806605. ^ a b Kershaw, Ian (2001). The "Hitler Myth": Image and Reality in the Third Reich. Oxford University Press. ISBN 978-0192802064. ^ a b Lepage, Jean-Denis G. G. (2008). Hitler Youth, 1922–1945: An Illustrated History (illustrated ed.). McFarland. p. 70. ISBN 9780786439355. ^ Tilman (2009), p. 15. ^ Knickerbocker, H.R. (2008). Is Tomorrow Hitler's? : 200 Questions on the Battle of Mankind (reprint ed.). Kessinger Publishing. p. 5. ISBN 9781417992775. ^ a b Mommsen, Hans (2003). The Third Reich Between Vision and Reality: New Perspectives on German History 1918–1945. German Historical Perspectives. Volume 12. Berg Publishers. p. 28. ISBN 9781859736272. ^ Winkler (2009), p. 55. ^ Boime, Albert (1987). Art in an age of revolution, 1750–1800. Social history of modern art. Volume 1. University of Chicago Press. pp. 400–401. ISBN 9780226063348. Boime states: "The brothers stretch out their arms in a salute that has since become associated with tyranny. The 'Hail Caesar' of antiquity (although at the time of the Horatti a Caesar had yet to be born) was transformed into the 'Heil Hitler' of the modern period. The fraternal intimacy brought about by the Horatii's dedication to absolute principles of victory or death ... is closely related to the establishment of the fraternal order ... In the total commitment or blind obedience of a single, exclusive group lies the potentiality of the authoritarian state." ^ Boime, Albert (1993). Art in an age of Bonapartism, 1800–1815. Social history of modern art. 2 (reprint, illustrated ed.). University of Chicago Press. p. 46. ^ Winkler (2009), p. 51. ^ Winkler (2009), p. 40. ^ Winkler (2009), pp. 70–101. ^ Winkler (2009), pp. 74–101. ^ a b Falasca-Zamponi, Simonetta (2000). Fascist spectacle: the aesthetics of power in Mussolini's Italy. Studies on the history of society and culture. 28 (illustrated ed.). University of California Press. pp. 110–113. ISBN 9780520226777. ^ Evans, Richard J. (2005). "The Rize of Nazism". The Coming of the Third Reich (reprint, illustrated ed.). Penguin Group. pp. 184–185. ISBN 9780143034698. ^ Kershaw, Ian (2001). The "Hitler Myth": Image and Reality in the Third Reich. Oxford University Press. p. 26. ISBN 978-0192802064. ^ a b c d Tilman (2009), p. 55. ^ a b Tilman (2009), p. 56. ^ Kershaw, Ian (2000). Hitler, 1889–1936: hubris (illustrated ed.). W. W. Norton & Company. pp. 294, 689. ISBN 9780393320350. ^ a b Hitler, Adolf (1 October 2000). Bormann, Martin (ed.). Hitler's Table Talk 1941–1944. trans. Cameron, Norman; Stevens, R.H. Preface and Introduction: The Mind of Adolf Hitler by H.R. Trevor-Roper (3rd ed.). London: Enigma Books. pp. 172–173. ISBN 1-929631-05-7. ^ Bishop, Ronald (2007). "A Case of First Impression". Taking on the Pledge of Allegiance: the news media and Michael Newdow's Constitutional challenge. SUNY Press. p. 27. ISBN 9780791471814. ^ Wireless to THE NEW YORK TIMES (27 September 1933). "Nazi Salute Banned in Prisons". The New York Times. p. 12. Retrieved 26 February 2010. ^ Tilman (2009), p. 51. ^ a b Tilman (2009), p. 61. ^ Shore, Zachary (2003). What Hitler knew: the battle for information in Nazi foreign policy (illustrated ed.). Oxford University Press US. p. 33. ISBN 9780195154597. ^ a b Tilman (2009), p. 60. ^ Tilman (2009), p. 34. ^ "Feldherrnhalle (Field Marshal's Hall) – Odeonsplatz". 2007. Archived from the original on 6 December 2010. ^ a b c d Tilman (2009), p. 35. ^ Tilman (2009), p. 38. ^ a b c d Schaap, Jeremy (2007). Triumph: the untold story of Jesse Owens and Hitler's Olympics. Houghton Mifflin Harcourt. pp. 163–166. ISBN 9780618688227. ^ a b Mandell, Richard D. (1987). The Nazi Olympics. Sports and society (illustrated, reprint ed.). University of Illinois Press. p. 149. ISBN 9780252013256. ^ a b Tilman (2009) pp. 80–82. ^ Reibert redivivus, in: Der Spiegel 5/1960, pp. 35–36, (27 January 1960), available online in the Spiegel Online archives (retrieved: 25 March 2013). ^ a b Tilman (2009), p. 82. ^ Heiber, Helmut (2004). Hitler and his Generals: Military Conferences 1942–1945 (Enigma Books ed.). Enigma Books. p. 398. ISBN 1-929631-28-6. ^ a b c Tilman (2009), p. 44. ^ Jay, Martin (2001). "From Modernism to Post-Modernism". In T. C. W. Blanning (ed.). The Oxford illustrated history of modern Europe. Oxford Illustrated Histories (illustrated, reissue ed.). Oxford University Press. p. 261. ISBN 9780192854261. ^ Reynoldson, Fiona (1996). "The Nazi Regime 1933–1945". In Rosemary Rees (ed.). Weimar and Nazi Germany. Oxford Illustrated Histories (illustrated, reissue ed.). Heinemann. p. 42. ISBN 9780435308605. ^ Gunther, John (1940). Inside Europe. New York: Harper & Brothers. p. 259. ^ Tilman (2009), p. 32. ^ Kershaw, Ian (2001). The "Hitler Myth": Image and Reality in the Third Reich. Oxford University Press. p. 69. ISBN 978-0192802064. ^ Kershaw (2000), pp. 561–562. ^ a b Kershaw (2000), p. 766. ^ a b Willett, Ralph (May 1989). "Hot Swing and the Dissolute Life: Youth, Style and Popular Music in Europe 1939–49". Popular Music. Cambridge University Press. 8 (2): 161. doi:10.1017/s0261143000003342. JSTOR 853465. ^ "Rechtsextremismus – Straftaten". hagalil.com. Retrieved 24 February 2010. ^ a b Tilman (2009), pp. 94–95. ^ a b "Criminal Code (Strafgesetzbuch, StGB)". Federal Law Gazette I. 13 November 1998. pp. 945, p. 3322. Retrieved 14 February 2010. ^ a b Tilman (2009), p. 95. ^ "Sechs Monate für Hitlergruß" (in German). Die Zeit/dpa. 23 November 2007. ^ Paterson, Tony (21 December 2007). "Dog's Nazi salute lands owner in jail for five months". The Independent. UK. Retrieved 1 March 2010. ^ "Kühnengruß oder sechs Bier bei FPÖ-Parteitag?". Kleine Zeitung (in German). 27 May 2009. Retrieved 27 August 2009. Second paragraph: "The Kühnengruß is regarded as a variation of the Hitler salute. In it the right arm is extended with three fingers spread. In Austria, unlike Germany, the salute is not prohibited." ^ Tilman (2009), p. 94. ^ "Hezbollah's Nazi roots". National Post. Archived from the original on 8 August 2013. ^ "hezbollah nazi salute photos". Photobucket. ^ "Eugene Terre'Blanche's Afrikaner Resistance Movement – Rally", YouTube. See 0:40 for salutes. ^ "AWB leader Eugene Terreblanche's funeral in Ventersdorp, South Africa, in pictures". The Telegraph. Retrieved 19 January 2018. ^ "South African white supremacist Eugene Terreblanche laid to rest". The Telegraph. 9 April 2010. Retrieved 19 January 2018. ^ "Asian fans racially abused in Euro 2012 stadium". BBC. 29 May 2012. Retrieved 29 May 2012. ^ "Greek footballer Giorgos Katidis banned for Nazi salute". BBC News. ^ Ruz, Camilla; Low, Harry (20 July 2015). "What is the context of the royal 'Nazi salute' film?". BBC News Magazine. Retrieved 22 July 2015. ^ Foster, Max (21 July 2015). "Should footage of young Elizabeth's 'Nazi salute' have been released?". CNN. Retrieved 22 July 2015. ^ "Queen Nazi salute film: Palace 'disappointed' at use". BBC News. 18 July 2015. Retrieved 22 July 2015. ^ "Palace considers legal action over leaked Queen Nazi salute film". BT.com. 18 July 2015. Retrieved 22 July 2015. ^ "Queen's Nazi salute footage is matter of historical significance, says the Sun". The Guardian. 18 July 2015. Retrieved 22 July 2015. ^ Goldstein, Joseph (20 November 2016). "Alt-Right Exults in Donald Trump's Election With a Salute: 'Heil Victory'". The New York Times. ^ Bradner, Eric (22 November 2016). "Alt-right leader: 'Hail Trump! Hail our people! Hail victory!'". CNN. Retrieved 20 October 2017. ^ Goldstein, Joseph (20 November 2016). "Alt-Right Gathering Exults in Trump Election With Nazi-Era Salute". The New York Times. ISSN 0362-4331. Retrieved 20 October 2017. ^ "Parents address school board as Nazi salutes in Baraboo High School prom photo spark outrage online". Baraboo News Republic. Retrieved 13 November 2018. 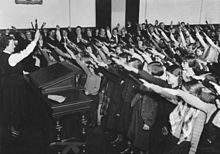 ^ "Wisconsin school district investigates photo of boys giving Nazi salute". The Guardian. Retrieved 13 November 2018. ^ "The Latest: Wisconsinites Rally for Love After Nazi Photo". The New York Times. Retrieved 13 November 2018. ^ "Wisconsin district investigates boys' apparent Nazi salute". WBAY.com. Retrieved 13 November 2018. ^ "Community distressed, divided after photo of Baraboo boys' alleged Nazi salute goes viral". NBC News 15. Retrieved 13 November 2018. ^ "Wisconsin high schoolers posed last spring in an apparent Nazi salute: Now, police are investigating". CNN. Retrieved 13 November 2018. ^ "Hogan's Heroes (TV Series 1965–1971)". IMDb. ^ Dawn Trimble Bunyak (1 August 2005). Our Last Mission: A World War II Prisoner in Germany. University of Oklahoma Press. p. xix. ^ Stelter, Brian. "CNN severs ties with Jeffrey Lord". CNNMoney. Retrieved 17 November 2018. ^ Raasch, Chuck. "Missouri Republican Ed Martin jumps into the Lord still-hot seat on CNN". stltoday.com. Retrieved 17 November 2018. Kershaw, Ian (2000). Hitler, 1936–45: Nemesis (illustrated ed.). W. W. Norton & Company. ISBN 9780393049947.